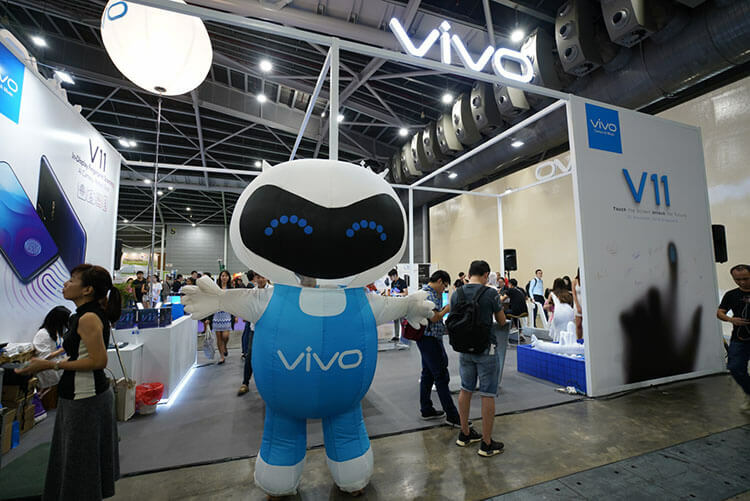 Congrats to Vivo who launched their latest V11 AI Smartphone in Singapore at SITEX 2018! 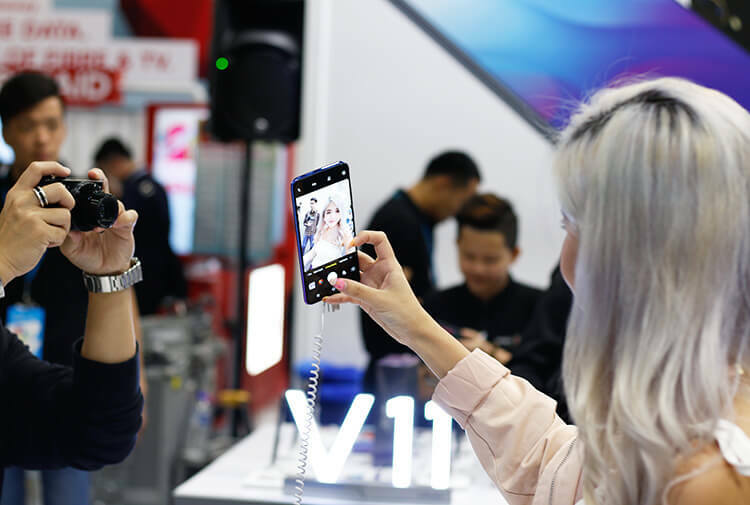 The launch was a success with over 100 pre-orders for the V11 smartphone placed by customers for the day. 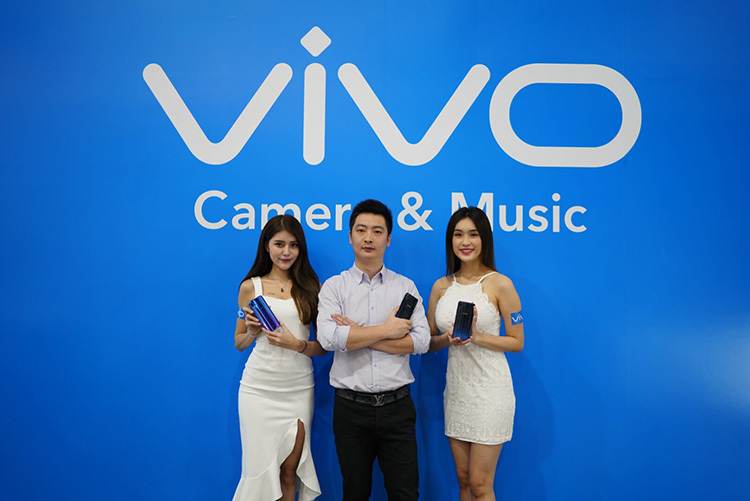 Thanks to Vivo, I had a great time at the Vivo booth! Lucky for me, I was one of the first in Singapore to experience their V11 AI smartphone. I even participated in some of the fun activities at the booth. Without further ado, let me take you on a walkthrough of the Vivo booth. Tech Lobang Alert!! 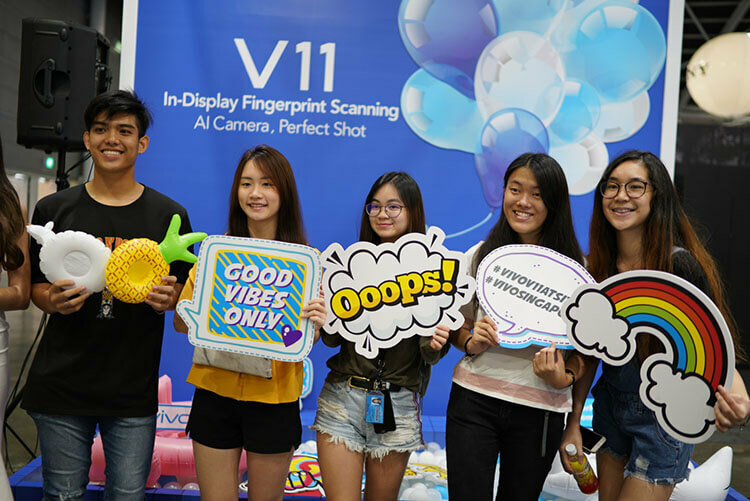 Stand a chance to win a V11 smartphone when you post photos taken at the photo spot at Vivo. 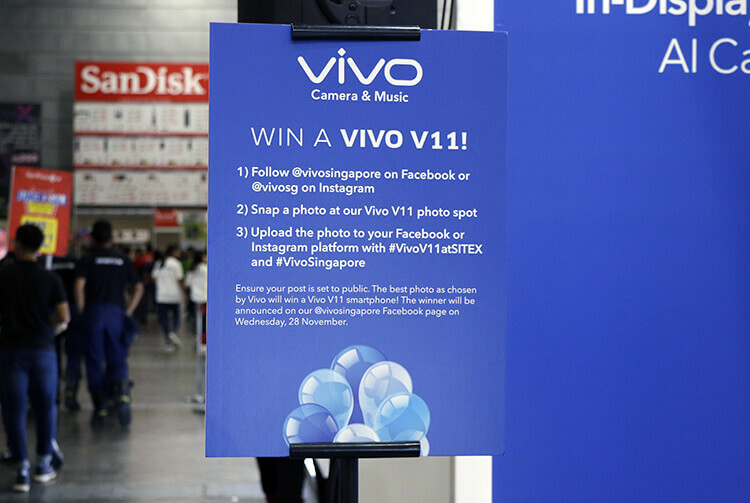 Remember to use the hashtags: #VivoV11atSITEX and #VivoSingapore, when you share your photos on Facebook or Instagram. Do look out for ongoing activities and free gifts handed out to attendees. 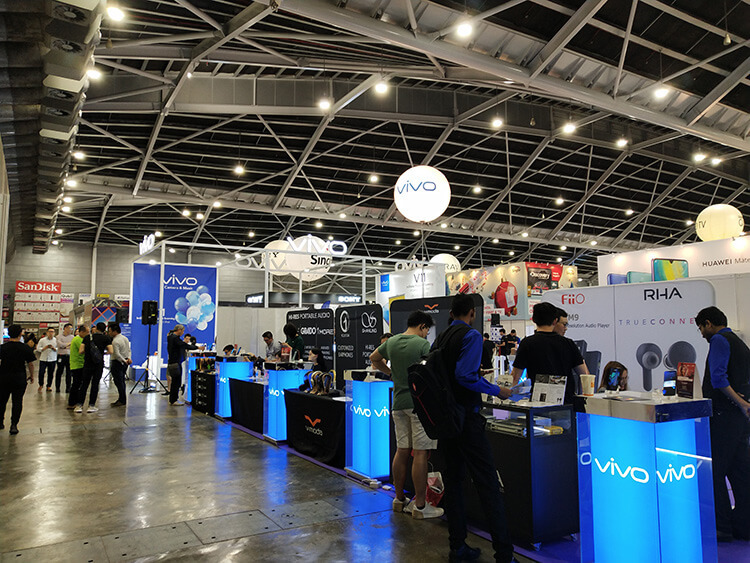 This year, Vivo is a Portable Audio Zone Experience Partner! This means that visitors can enjoy various audio experiences at the Portable Audio Zone when they pair different models of headphones with the X21 smartphone. Using customised earpiece available, I plugged into the X21 (equipped with Hi-Fi audio chip) to test out the sound quality. 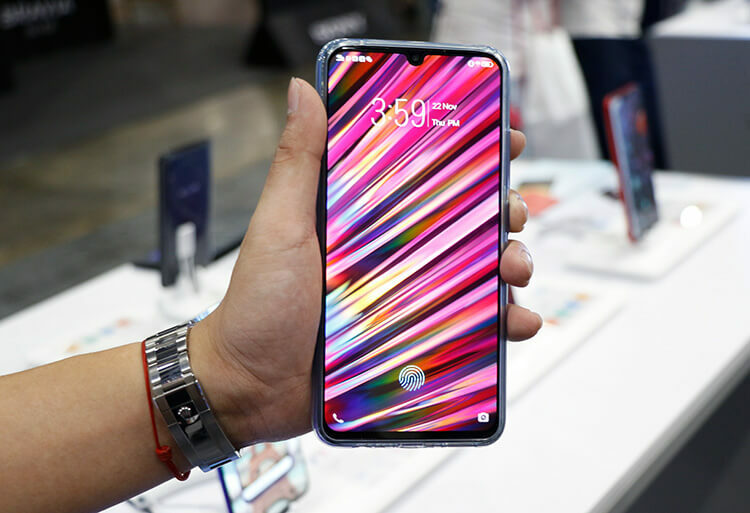 It produced crystal-clear sound quality and good noise isolation – I must say that Vivo smartphones are a great choice for music lovers as well. Are you looking for an all-new AI smartphone? You may want to consider V11 as your preferred choice! Check out my first impression below. The seamless V11 AI Smartphone comes in Nebula and Starry Night colours, featuring the new Halo FullView Display. It has a 12MP + 5MP dual rear camera combination with a large f/1.8 aperture and 1.28μm pixels, as well as a 25MP front camera. The V11 smartphone runs on Funtouch OS 4.5 (Based on Android 8.1) and many more features for your one-touch experience. It comes with dual-engine fast charging which allows for 2.5 hours talk-time in just 5 minutes of charging. 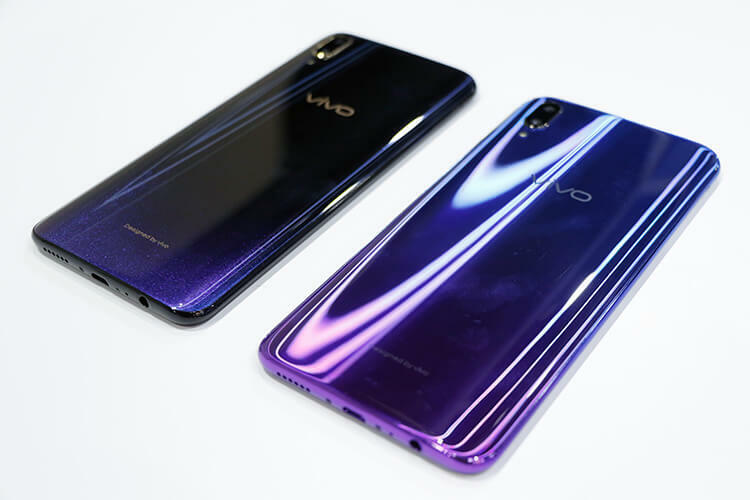 In-Display fingerprint scanning is one of the highlights in Vivo’s V11 AI Smartphone. 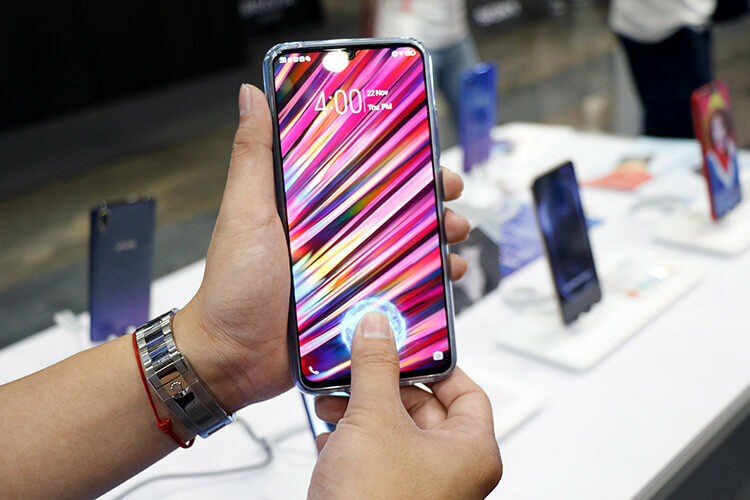 It is the first in the V series to incorporate In-Display Fingerprint Scanning Technology (4th generation), continuing Vivo’s technology leadership in biometric security. 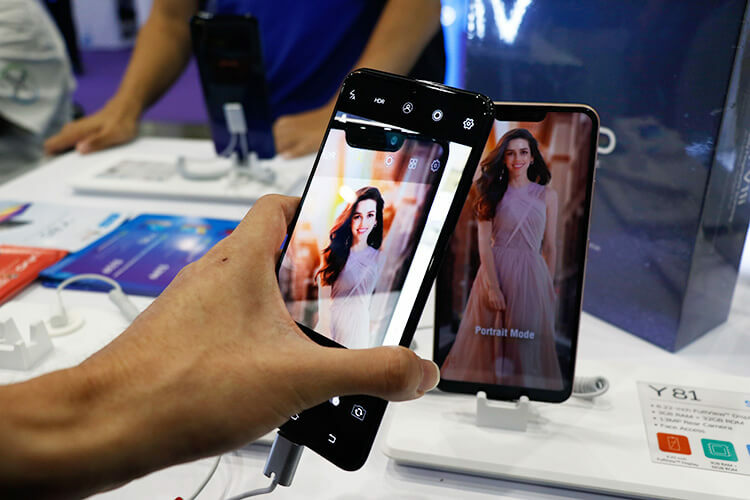 The In-Display fingerprint scanning technology allows users to conveniently unlock their smartphone by just ONE-Touch on screen, in just 0.03 second (even when the phone is in placed up-side down!). Do you have difficulty in capturing a perfect portrait or landscape shot? Especially when you are in the over-exposed or under-exposed environment? Well, V11 AI camera mode will solve all your photography problems! The AI Backlight HDR and AI Low Light Mode in V11 AI camera helps users to capture the picture-perfect moment in any scenario. It uses the AI algorithms to capture multiple frames for greater detail and combine them to create perfectly exposed photos – even for difficult lighting environments such as sunsets. What’s more? 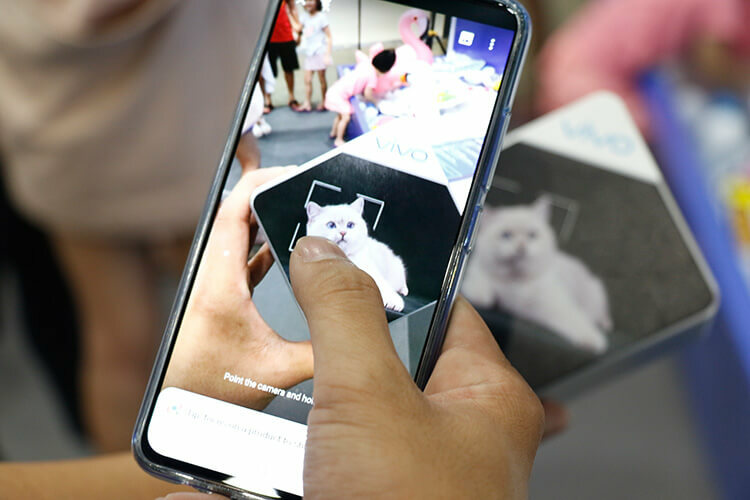 Vivo V11 expands the AI mobile experience across the board with Vivo’s AI assistant Jovi, with features like Jovi Smart Scene, Google Lens and Google Assistant. Jovi Smart Scene makes everyday life easier by recognising user scenarios and acts accordingly, including checking the weather and providing real-time information. Google Assistant helps with everyday situations like map navigation, online shopping, travel arrangements, while Google Lens, backed by advanced deep-learning algorithms, allows users search for what they see. I personally like these features a lot because it allows me to find the information within the shortest time, anywhere, any time. The Vivo V11 is powered by the Snapdragon 660AIE processor with 6GB RAM + 128GB ROM, ensuring ultra-smooth performance. Not only does the Vivo V11 has peak performance perfect for gaming, the newly updated AI Game Mode allows you to game on-the-go with quality-of-life features such as Floating Call Alerts, Background Calls and a newly-added Game Assistant. A simple sideways swipe gives you quick access to all the above functions, so you can access them without interrupting your game. In addition, the Auto Gaming Mode allows you to attend to other matters while your game runs in the background, ensuring you never lose your progress. Bikers can use the Motorbike Mode to handle incoming calls safely while riding. You can set your phone to auto reject calls and respond with an SMS during rides, or answer calls from selected numbers. You can also set to mute all notifications entirely, or to answer calls after the motorbike has stopped. This makes it extremely convenient and safe for bikers to stay focused on the road. I am impressed by the V11 smartphone lightweight design and smart features. It comes with the latest In-Display Fingerprint Scanning Technology which gives a unique futuristic look and feel to this smartphone. With V11, I have no doubt in capturing a crystal-clear shot using their 25MP AI front camera functionality. I believe V11 is the up-and-coming AI smartphone that will make our life smarter and more convenient. 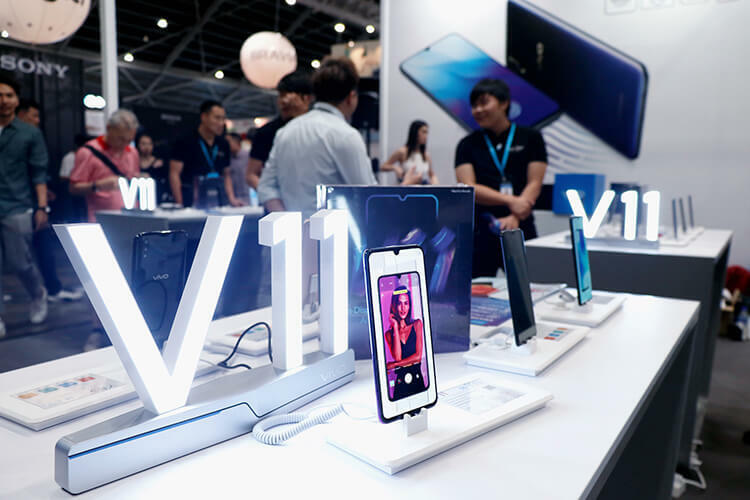 The Vivo V11 is available for pre-order $599 (without contract) exclusively at the Vivo booth 5C02 (Hall 5). 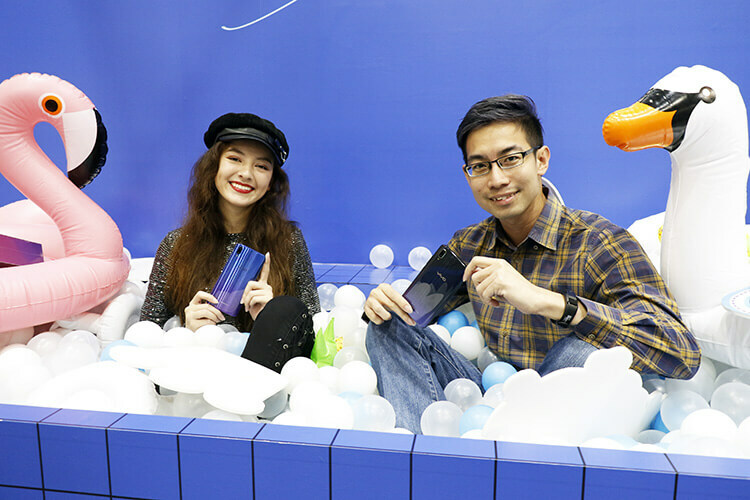 Customers who pre-order the Vivo V11 will receive complimentary delivery, a JBL GO portable Bluetooth speaker worth $89.90 and V11 gift box worth $49.90. StarHub customers may visit Booth 5E07 (Hall 5) for promotions on Vivo’s existing X21, V9, and Y85 models. 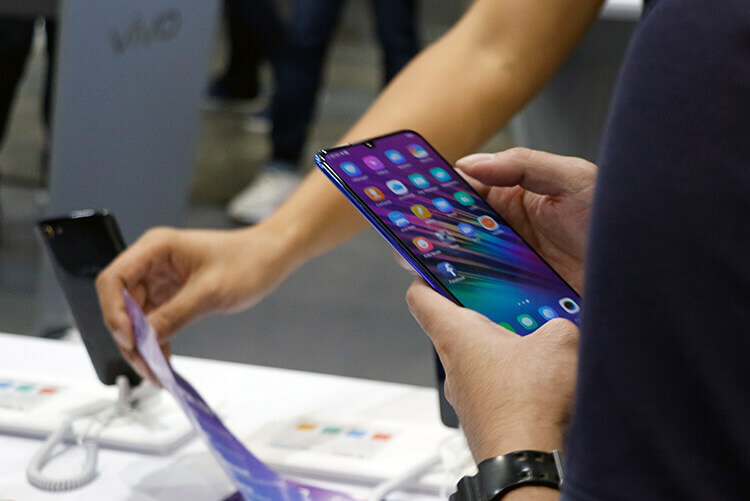 During this period, M1 customers can also visit www.m1.com.sg for the latest SITEX promotions and enter a lucky draw to win Vivo X21 smartphones. Vivo Refund giveaway worth $12,000! Customers who buy a Vivo V11 can get a chance to “win” refunds! 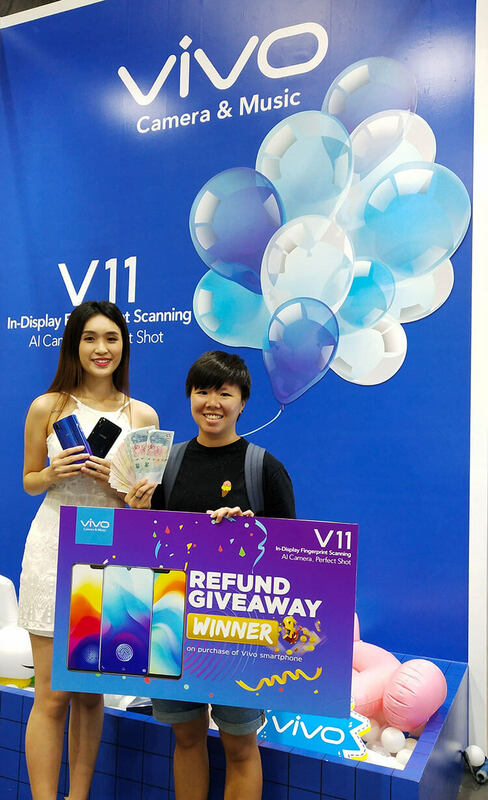 Yes, Vivo is holding a refund giveaway worth $12,000 where 20 customers will get a full refund over four days, on their smartphone purchase from the Vivo or partner booths. Check out this lucky customer who won herself a refund! from 22 to 25 November.